Save the image as a file (BMP, JPG, GIF, PNG), send it by email, print it, copy it to the clipboard, or open it in your image editor or Microsoft Paint. You can capture the entire screen, just the contents of one window, or any one of 10 custom shapes: rectangle, ellipse, circle, square, rounded rectangle, racetrack, triangle, diamond, hexagon, octagon. The image can be rotated to any angle, mirrored, flipped, scaled, color inverted, made black and white. It can be stamped with the date, time, or your name. Many custom backgrounds (32 patterns) are provided and the edges can be blended. You can create nice portraits, like the tiger cub shown above with a blue pattern background and blended edges. Cappy can capture any image you can get up on the screen. It does not matter which program is displaying the image. Then select the capture area shape. Choose rectangle, entire screen, ellipse, circle, square, rounded rectangle, racetrack, triangle, diamond, hexagon, octagon, or window contents. Then click and drag on the screen to select the capture area. If you select window contents just click once anywhere inside the window and all of the contents inside the window will be captured. Up pops the Previewer screen you see at the top of this page above. The little menu on the lower right is erased before the screen is recorded so that it will not appear on the saved screen. Some programs and web pages try to prevent you from copying their graphics. Cappy can still capture the screen even if the printscreen key is disabled. Some programs will not start if a screen capture program is detected as running. The trick here is to get the graphics up on the screen and then start Cappy. Then just capture the screen. If you want to do this, make sure the Capture PrintScreen box (Settings menu) is not checked or the other program will see that Cappy is running. When you surf the web and you can capture anything you see. This is a 32 bit program and will run on Windows ME, NT, 2000, XP, Vista, Windows 7, Windows 8, and Windows 10. It also runs fine on 64-bit systems. See the bottom of this page if you would like to purchase Cappy for just $20.00 (Twenty US Dollars). This trial version will operate for 14 days. It also places the word "Cappy" on the bottom left of each captured screen. If you purchase the program I will send you a serial number by email that will remove this line, enable continued operation with no time limit, and automatically place your name on the PowerPoint slide, Word Document, or Excel Spreadsheet. Pay once and all future upgrades are free. Your serial number will work with all future versions. This program, like all my programs, contains no spyware, no advertising. If you purchase this program and are not satisfied with it for any reason I will refund your money. Reading across the top of the previewer screen you see the following menu buttons. The function of each button is also included in the pulldown menus above the buttons. If you do not like the way the capture looks in the previewer, press this button to try the capture again using the same capture shape. If you would like to try a different capture shape you can use the drop-down shape box to pick a new shape and then press the retry button. You can also use the shape box to change the shape of the current capture. For example, if you made the capture using a rectangle you can use this box to see what the same capture would look like as an ellipse. Try all the shapes to see which one looks best. Save the captured image as a file. You can choose from a BMP, JPG, GIF, or PNG file. You will get the best image quality using a BMP file, but the JPG file offers a much smaller file size. The GIF file is also fairly small, but the format is limited to 256 colors so you may see some color distortion. The PNG file is usually about the size of the JPG file but I think the image quality is better than JPG. Copy the image to the Windows Clipboard. You can then paste the image into any capable Windows program. Rotates the image clockwise by any angle. Select the rotation angle in the small drop-down box just below this rotation box. You can also type in any positive number with up to 2 decimal places. If you select 0.00 in the box then all rotations are removed and the image is reset to the original position of 0.00 degrees. You can also rotate using the two smaller rotation buttons or the menu. Each time you press a button the image will rotate by the number of degrees (increment) shown in the drop-down box. So if the box shows 10.25 degrees and you click the button twice the image will rotate a total of 20.50 degrees. Cappy can rotate in any increment from 0.01 degrees to 359.99 degrees in either direction. Small rotations are useful if you are trying to level a scanned image that is not quite aligned with the edge of the page. If you have the date stamp option on then the date stamp will be erased, the image rotated, and the date stamp will be reapplied across the top of the image. If you have mirrored or flipped the image these are done first and the rotation is done last. Cappy is unusual because it allows you to rotate to any angle. Most programs can only rotate by 90 degrees. This is the easiest rotation because all of the pixels map one-to-one. Rotation to other angles is much more difficult because you must interpolate between pixels. Cappy also uses an anti-alias routine to eliminate the stair-step appearance (jaggies) that sometimes appear when a straight horizontal or vertical line is rotated by an angle that is not a multiple of 90 degrees. You may also notice that rotation causes the size of the image to change. You can force the image to keep the same size by pressing the "Clip Rotated Image" button or menu item. The button is a white square with a black border like this just below the big copy button. With clipping on the edges of the image will be clipped when rotated. If the image is not clipped, the "extra" space will be filled by the background color. If you are using a pattern background, then the fill color will be the last solid color selected before the pattern was selected. If you select a background color that is the same as the background in the image then the borders of the image will be invisible when rotated. You can pick the background color from the screen using the "Pick Background Color on Screen" button which looks like an eyedropper like this just below the big program button. Opens Microsoft PowerPoint, creates a slide, and then puts the image on the slide. PowerPoint will open in Landscape mode (wide) if you have the PowerPoint Landscape item checked in the "Settings" form, or in Portrait mode (tall) if you have the PowerPoint Portrait item checked. It can also place a line of text in an editable text box on the lower left, and the date on the lower right. You can turn these text boxes on or off in the Settings form. The lower left text box can be customized in the purchased version only. Once the slide is created both text boxes can be edited or erased in PowerPoint. You can then do any of the many functions contained in PowerPoint such as add text, titles, labels, or other images. If you capture additional images then a new slide will be added if you have the New Sheet item checked in the "Settings" form. If you have the Same Sheet item checked then the capture will be added to the same slide. These will appear in the same presentation. If you already have an existing presentation open it will not be disturbed. Cappy will only write to the presentation it has created. You can save or close the presentation at any time. If you close PowerPoint completely then a new presentation will be created the next time you use this function to send an image to PowerPoint. If the image is larger than the slide, it will be scaled down to fit the slide. You can then use the Format Picture command in PowerPoint to resize the image. This method will allow you to maintain the original ratio of width to height (aspect ratio) so the image does not become distorted. Or just click and drag the edges of the image to resize, but this method will sometimes introduce distortion. Cappy will work with any version of PowerPoint. Of course you must have PowerPoint installed on your computer to use this function. Note: In some version of Microsoft Office I have found Word and Excel to have better image clarity than PowerPoint. If you have these programs then experiment to see what looks the best. Opens Microsoft Word, creates a document, and then puts the image on the document. Word will open in Landscape mode (wide) if you have the Word Landscape item checked in the "Settings" form, or in Portrait mode (tall) if you have the Word Portrait item checked. It can also place 2 lines of text above the image. The first line can be any text you choose. The second line is the date. You can turn these lines on or off in the Settings form. The top can be customized in the purchased version only. Once the document is created both lines can be edited or erased in Word. You can then do any of the many functions contained in Word such as add text, titles, labels, or other images. If you capture additional images they will be added to the bottom of the document. These will appear in the same document. If you already have an existing document open it will not be disturbed. Cappy will only write to the document it has created. You can save or close the document at any time. If you close Word completely then a new document will be created the next time you use this function to send an image to Word. If the image is larger than the document, it will be scaled down to fit the document. You can then use the Format Picture command in Word to resize the image. This method will allow you to maintain the original ratio of width to height (aspect ratio) so the image does not become distorted. Or just click and drag the edges of the image to resize, but this method will sometimes introduce distortion. Cappy will work with any version of Word. Of course you must have Word installed on your computer to use this function. Opens Microsoft Excel, creates a spreadsheet, and then puts the image on the spreadsheet. It can also place 2 lines of text above the image. The first line can be any text you choose. The second line is the date. You can turn these lines on or off in the Settings form. The top can be customized in the purchased version only. Once the spreadsheet is created both lines can be edited or erased in Excel. You can then do any of the many functions contained in Excel such as add text, titles, labels, or other images. If you capture additional images then a new worksheet will be added if you have the New Sheet item checked in the "Settings" form. If you have the Same Sheet item checked then the capture will be added to the same worksheet. These will appear in the same spreadsheet. If you already have an existing spreadsheet open it will not be disturbed. Cappy will only write to the spreadsheet it has created. You can save or close the spreadsheet at any time. If you close Excel completely then a new spreadsheet will be created the next time you use this function to send an image to Excel. If the image is larger than the worksheet, it will be scaled down to fit the worksheet. You can then use the Format Picture command in Excel to resize the image. This method will allow you to maintain the original ratio of width to height (aspect ratio) so the image does not become distorted. Or just click and drag the edges of the image to resize, but this method will sometimes introduce distortion. Cappy will work with any version of Excel. Of course you must have Excel installed on your computer to use this function. This button will pop up the following screen that allows you to export the image to different programs. These can be any image viewing or editing program capable of working with a BMP file. 1) Use Program Above - You can type in the path to any program. Or click the Browse button to look for a program. Or click the Default button to automatically fill in the Windows default program for a BMP file. 2) Use Default Program - Uses the Windows default program for a BMP file. 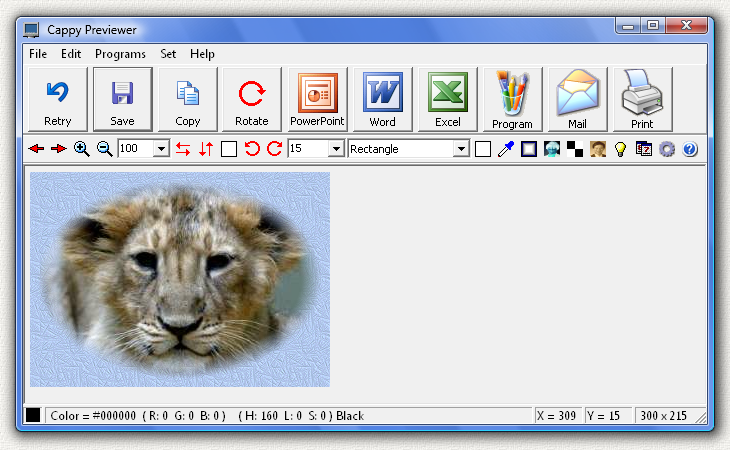 3) Use Microsoft Paint - Every Windows PC comes with this free image editing program. Then press the OK button to open the image in the selected program. If you would always like to always open the same program without asking, then click on the small check box that says Don't Show This Screen. The program will remember your image program preferences the next time it is run. The image is automatically saved as a BMP file named capture-temp.bmp located in the same folder as cappy.exe. Then it is opened by the program. If the program is an editor you can edit and save the image anywhere you like. The BMP format was chosen since it is the highest quality image, but most image programs will allow you to save the file in several different formats. You can also open any of the programs above, including the MS Office programs, by selecting the Programs menu item on the top of the Previewer screen. Saves the image as a JPG file (capture-temp.jpg) and attaches it to an email message using your default email program. This opens the Windows print dialog and allows you to print the image on any printer on your computer or network. There are several functions that are available in the menu on the top of the Previewer. Most of these functions are also available by pressing the small buttons at the top of the screen. If you would like to try a different capture shape you can use the drop-down shape box to pick a new shape and then press the retry button. You can also use this shape box to change the shape of the current capture. For example, if you made the capture using a rectangle you can use this box to see what the same capture would look like as an ellipse. Try all the shapes to see which one looks best. Paste an image from the Windows Clipboard. You can then change the image using functions in this program. Rotates the image clockwise by the angle in drop-down box. See big rotate button above. If you have the date stamp option on then the date stamp will be erased, the image rotated, and the date stamp will be reapplied across the top of the image. Rotates the image counterclockwise by the angle in drop-down box. See big rotate button above. If you have the date stamp option on then the date stamp will be erased, the image rotated, and the date stamp will be reapplied across the top of the image. Clip the image after rotation to keep the same image size. Turn clip off and after rotation the image will be increased in size so that the corners of the image are not clipped off. Mirrors the image from left to right. If you have the date stamp option on then the date stamp will be erased, the image mirrored, and the date stamp will be reapplied across the top of the image. Mirrors the image from top to bottom. If you have the date stamp option on then the date stamp will be erased, the image mirrored, and the date stamp will be reapplied across the top of the image. Scales the image size up by 5 percent. The actual image is scaled, not just the view, so if you save an image that has been scaled up the saved image will be larger. The scale can also be changed using the drop-down scale box to the right of the scale buttons as shown here: For example, if you select 200 in this box the scale will be 200 percent or twice size. You can also scale by typing in a value from 1 to 400 in the drop-down box. Scales the image size down by 5 percent. The actual image is scaled, not just the view, so if you save an image that has been scaled down the saved image will be smaller. The scale can also be changed using the drop-down scale box to the right of the scale buttons as shown here: For example, if you select 50 in this box the scale will be 50 percent or half size. You can also scale by typing in a value from 1 to 400 in the drop-down box. Invert the colors of the captured image. This will make a photo appear like a film negative. If the captured image is already a negative it will appear normal when inverted. You can use this on blueprints (white lines on a black background) to change the capture to black lines on white background. Change the capture image to black and white. Technically this is actually a "grayscale" image that contains many shades of gray, but most people call this black and white. Change the capture image to sepia tone, a type of image in which the image appears in shades of brown. Puts the date, time, or your name on the upper left corner of the image. See the Settings section below to select the stamp type. Press this button again and the stamp will be removed. The stamp will remain there even after the image is mirrored or rotated. You can also turn on the stamp feature in the settings menu. Once you turn the stamp on all images will be stamped until you turn it off. The program will remember your stamp preference the next time it is run. Brings up a screen of settings options. See Settings section below. Brings up a screen to change the background color or change the background pattern. See Background section below. Use the mouse cursor to select any onscreen color that will then be used as the background color. To hide the edges of a captured image pick a color that is already in the background. Blend the edges of the captured image so they appear fuzzy. The width of the fuzzy band is 15 pixels but you can change this on the Settings screen to any value. To make a nice portrait use the ellipse capture shape and pick one of the background patterns. On the top are the settings for the programs in Microsoft Office. If you purchase this program your name can be put into the PowerPoint, Word, or Excel files by using the "Put User Name on Slides" checkbox. This text can be your name or anything else you choose. It will be put on the bottom of the PowerPoint slide, or on the top of the Word document or Excel spreadsheet. Use the "Put Date on Slides" checkbox to put today's date on the slide. Click the "Font" button on the top right and a popup font menu allows you to change the font type, size, color, and make it normal, bold, or italic. You can set PowerPoint, Word, and Excel to open in either Portrait (tall) or Landscape (wide) mode. You can change this at any time, but previously captured images will be somewhat distorted. It is better to choose a mode before you capture any images and stay in this mode so the images will not be distorted. Because of the way these programs are designed all of the slides/documents/sheets must be in the same mode. So if you change modes, all of the slides/documents/sheets will change to the new mode. In the box on the right set "Same Sheet" and all of the captured images will be put on the same PowerPoint slide or Excel worksheet. Select "New Sheet" and a new slide or worksheet will be created for each capture. You can change this setting before or after the file has been created. You can change it as many times as you like. So you can put some of the captures on the same slide/worksheet and others on a new one. This setting applies to both PowerPoint and Excel, but does not apply to Word where the captures are always put in the same document. When put on the same slide or worksheet each capture is put in a slightly different position so they are easy to grab and move around. 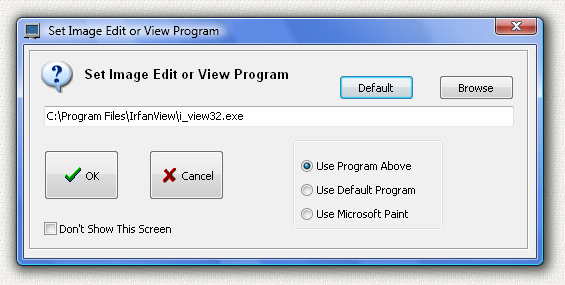 Stay on Top - Click this checkbox and the Previewer will stay on top of other windows. 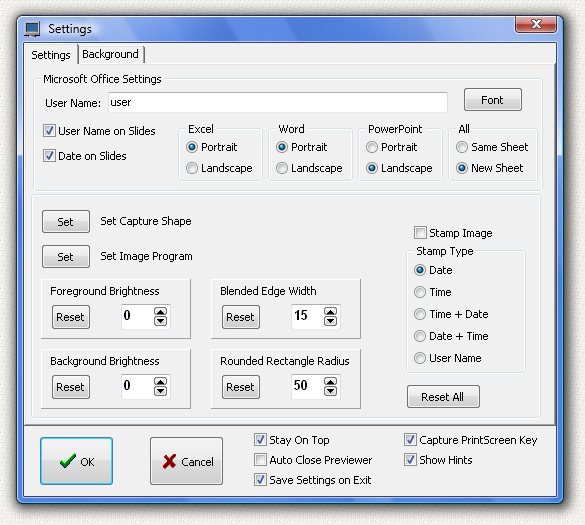 Auto Close Previewer - Click this checkbox and the Previewer will automatically close after the captured image is placed into PowerPoint, Word, Excel, or the image editor. If you want to put the same capture into more than one program, uncheck this box so that the previewer stays open. Save Settings on Exit - Click this checkbox and all of the current settings will be saved when you exit this program. 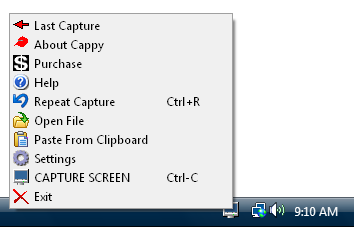 Capture PrintScreen Key - By default Cappy "hooks" or "captures" the PrintScreen key when it is running. 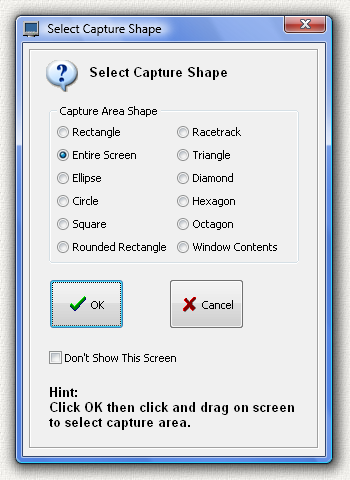 When you press the PrintScreen key up pops the menu to select the capture shape. So you can capture part or all of the screen. The full screen capture is still sent to the clipboard so you can paste it into other programs. Uncheck this box and Cappy will not capture the PrintScreen key. You can turn this feature on and off while Cappy is running. Some programs will not start if a screen capture program is detected as running. Turn Capture PrintScreen off and the other program will not detect Cappy. Show Hints - When the mouse is placed over a button a hint is briefly displayed. Uncheck this box to turn the hints off. Stamp Image - Check this box to put the date, time, or your name on the upper left corner of the image. Just below this checkbox you can select one of 5 different stamp types: Date only, Time only, Time + Date, Date + Time, or your User Name. Uncheck this box and the stamp will be removed. The stamp will remain there even after the image is mirrored or rotated. You can also turn on the stamp feature in the main menu on top. Once you turn the stamp on all images will be stamped until you turn it off. Rounded Rectangle Radius is given in percent of the short side of the captured rectangle. So the default of 50 percent means that the corner radii together occupy 50 percent of the short side. The maximum value is 100 which causes the capture to be racetrack shaped with a full diameter (and no flat) on each of the short sides. Blended Edge Width is given in pixels. Increasing this number gives a larger fuzzy area around the capture if the Blend Edges button or menu item is selected. The default is 15 pixels. Foreground Brightness - Changes the captured image foreground brightness. Minimum brightness is -255 (all black) and maximum brightness is 255 (all white). Background Brightness - Changes the captured image background brightness. Minimum brightness is -255 (all black) and maximum brightness is 255 (all white). Reset Button - Resets the following to default values: Rounded Rectangle Radius = 50, Blended Edge Width = 15, Foreground Brightness = 0, Background Brightness = 0. All of these settings will be preserved the next time the program is run if you have the "Save Settings on Exit" box checked. Click on a color or pattern to set the background on the captured image. The background is shown in the sample tile in the upper left. You can also press the buttons to "Define Custom Colors" or import your own "Custom Tile" as a background. The imported tile image can be a JPG, BMP, GIF, or PNG image file of any size. If the tile is smaller than the captured image it will be repeated (or tiled) to fill the entire background. 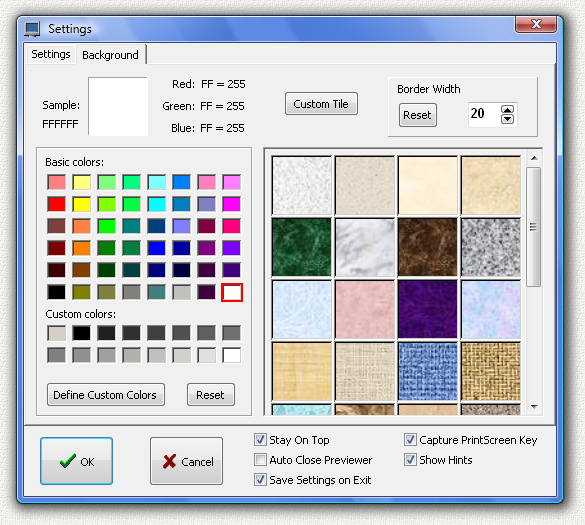 The program will remember these background settings including the custom colors or tile. 32 different background tiles are provided, one custom tile can be saved. You can also set the border width around the captured image. The size of the border is in pixels and the default border size is 20 pixels. Press the overwrite button to overwrite the file. Press the rename button to save the file with a different name. The new name will be automatically generated. 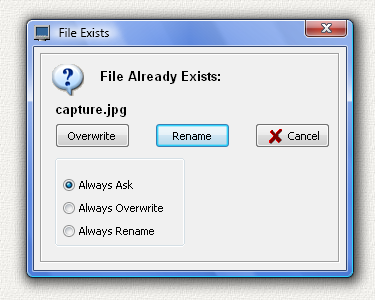 If the file is named "capture.jpg" then the new file will be named "capture(1).jpg". If you try to save another file of the same name and press rename then the number in parenthesis is increased by 1. If you check the circle "Always Overwrite" and save another file of the same name then Cappy will automatically overwrite the file without asking permission. If you check the circle "Always Rename" then it will always rename the file without asking permission. These "always" options will persist for the entire program run but will reset to "Always Ask" the next time you run the program. As an Administrator run the program cappy-setup.exe to install the program. The install program will overwrite any previous version so you are not required to uninstall older versions. The install program will create a folder, copy all the files to the folder, and create shortcuts on the desktop and the start menu. This is a 32-bit program designed for Windows 98, ME, 2000, NT, XP, Vista, Windows 7, Windows 8, and Windows 10. It also runs fine on 64-bit systems. The installed size of the program is less than 2 megabytes. The program saves its settings in the Windows Registry when you exit from the program. An alternate install method is to download the executable file cappy.exe and then just run the program. You can create your own Desktop Shortcut or other shortcut links. This program is Copyright © 2004 Michael Robinson. All Rights Reserved. Use this program at your own risk. If you purchase this program and are not satisfied with it for any reason I will refund your money. You may give this file away free, but you may not sell it. It must be distributed as a package along with all files. Modification of the executable file is prohibited. 1.0.0 Mar 17, 2004 Initial Public Release. 2.0.0 May 09, 2004 Many New Features Added. 3.0.0 Jul 30, 2004 Even More Features Added. 3.5.0 May 26, 2007 Updated for Windows Vista. Added PrintScreen key capture. 3.7.0 Sep 1, 2008 Added save transparent GIF file option. Added repeat capture. Added hotkeys for capture and repeat capture for one keypress captures. Added display of color numbers on bottom line for Hue, Luminance, and Saturation. This trial version will operate for 14 days. It also places the word "Cappy" on the bottom left of each captured screen. If you purchase the program I will send you a serial number by email that will remove this line, enable continued operation with no time limit, and automatically place your name on the PowerPoint slide, Word Document, or Excel Spreadsheet. Pay once and all future upgrades are free. Your serial number will work with all future versions. This program, like all my programs, contains no spyware, no advertising. The purchase price is $20.00 (Twenty US Dollars). I accept major credit cards, PayPal , or personal checks. Press one of the links below and your browser will open and go to PayPal with all the purchase information already filled out. I use PayPal because the fees are low. If you send me $20.00 PayPal only takes about $1.00 so I net $19.00. All other payment services take several dollars so I would have to charge around $25 for my program to gain the same net. This lowers the cost to you. PayPal is usually free for most transactions, such as Ebay auction payments, but as a business I am required to have a Premier Account with fees. If you do not have a PayPal account, you can still use PayPal to make a payment using your credit card. PayPal does not charge you any fees for this. PayPal is a very secure and reliable payment system used by millions of people around the world.